A vlovely 3"long vintage pocket Souplex Razor in its bakelite case. An extremeley rare 8 x 6" cardboard shop advertising sign for Britaris British Table Water ( as supplied to the House of Lords). A bit scuffed but still good enough to frame or display. 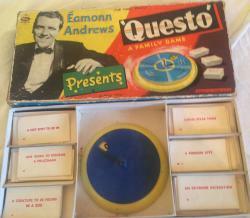 This was the predecessor to the classic Tell Me game of the 1960s. Comes with all the cards and the instructions are on the back of the lid. An early cardboard advertising sign for Lyons Tea featuring a man in a Pith helmet. It is approximately 8 x 6" and although clean and undamaged, there is a small bit of discolouration in the bottom left hand corner. A bit worn around the edges. A charming small wooden jigsaw by an unknown maker depicting a drinking scene. Coming in its green bakelite case, this is a vintage ever Ready Safety razor. The box is complete, and very clean. A great 18 x 12" vintage cardboard point of sale card advertising Moorland Indigestion Tablets. It still has its fold out leg. Some very minor creasing , mainly in the bottom left hand corner but a super picture. unusual edwardian tin ice cream bombe mould. A wonderful early Ice Cream Bombe Mould for creating a multi coloured ice creme bombe. It is just under 9" long. Could do with a clean. vintage marx tin plate turn over cat, working. Early 1960s tin plate tumbling cat which was made by Marx. He rolls over and plays with the ball. In full working condition, it has a few minor scrapes only. A 1950s bakelite and metal small electric paint stripper which comes in its box. Probably one of the first ever made and doesnt look as if it would be that useful. Untested but still in good condition.